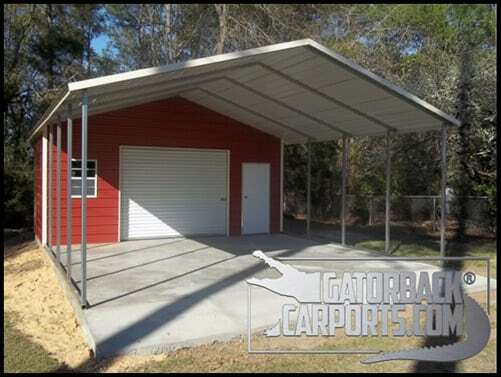 How to Purchase the most Affordable Metal Garage or Carport, level the Ground, and prepare the Slab. 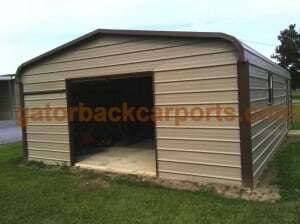 Home/Concrete Pad Size Suggestions, Metal Garage/How to Purchase the most Affordable Metal Garage or Carport, level the Ground, and prepare the Slab. The article above also explains the installation of a brick ledge which is also very important. 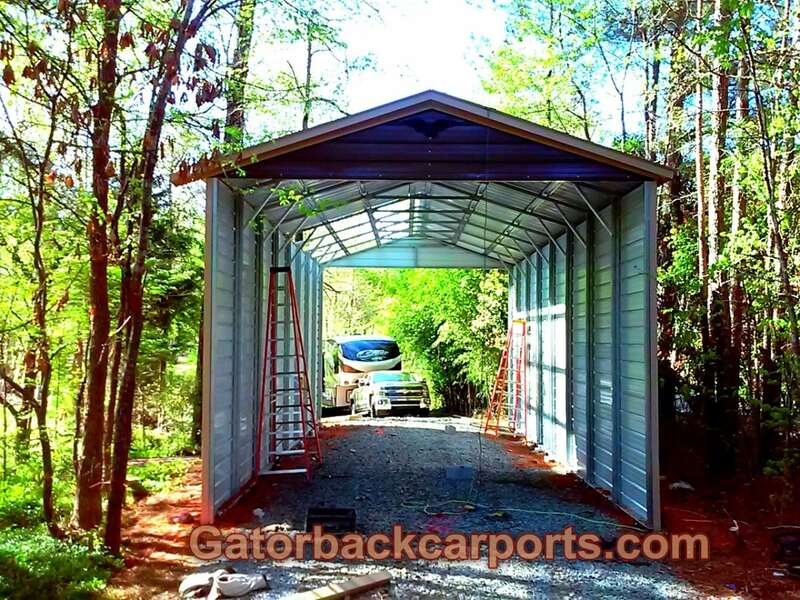 At Gatorback Carports we offer three types of garages. 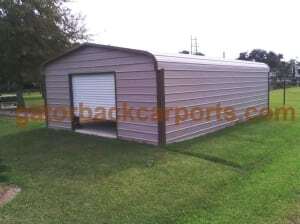 Here’s a picture of our best priced regular style garage. 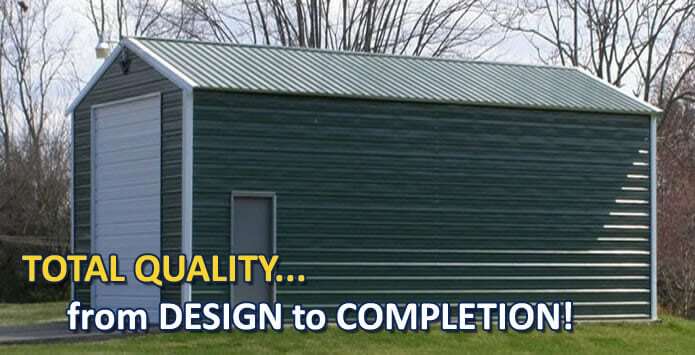 It is very economical when you consider the of cost materials and building costs. 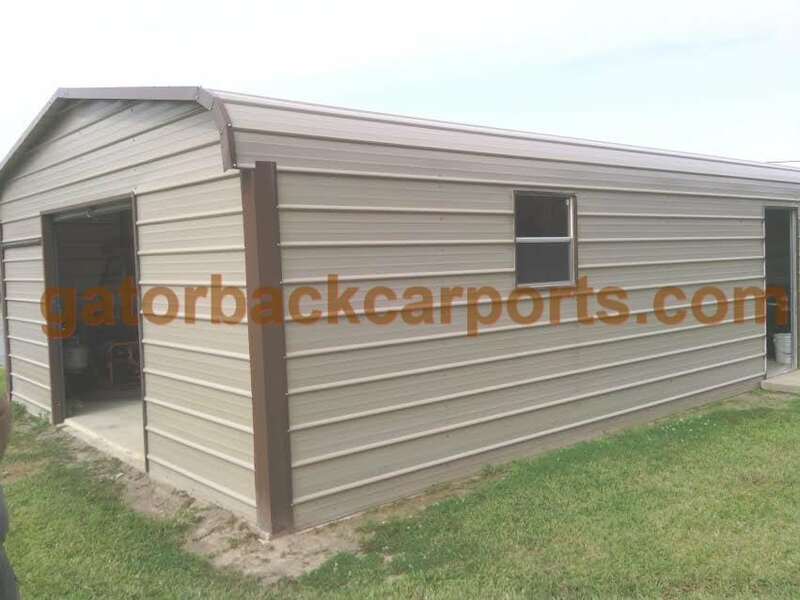 Our price for this 20′ wide by 26′ long by 7′ tall regular (horizontal roof) garage includes two 8′ wide by 7′ tall standard roll up doors in the front and rear, one walk in door, and one window for only $4,785. 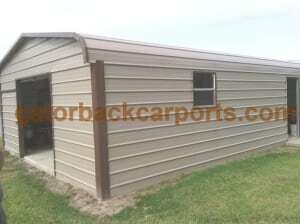 We also offer a vertical roof garage, and a boxed eve style garage. This steel garage is called a regular style meaning it has a horizontal style roof structure. Please see the article under FAQS Roof Systems and their differences to understand the 3 roof systems and their functions. 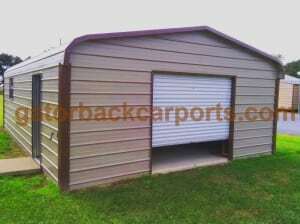 Choosing the right size garage roll up door is important. 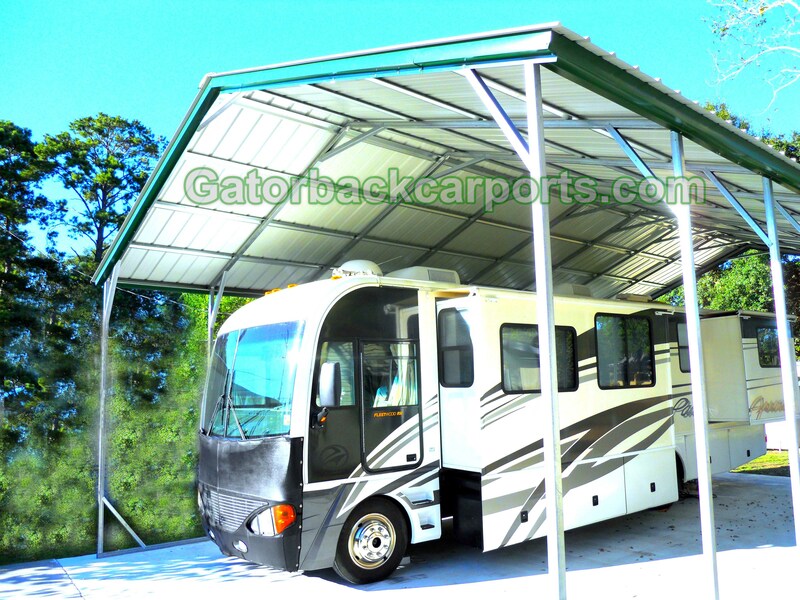 We have doors up to 12 and 14 feet high for an RV, and 12 and 14 feet wide. The smallest roll up door is a 6’wide by 6 tall. Before you pour your concrete there are steps you can take to ensure that rain water will not enter your building. Look how we designed the edge of the concrete so that water will not flow over it. 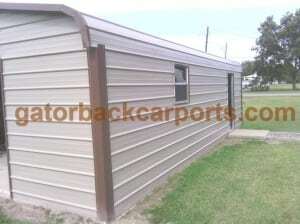 This is called a step back and your garage door will stop just in front of the back edge. 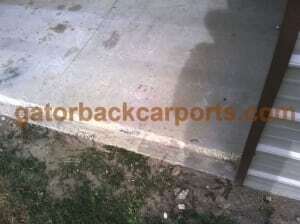 The next pictures will show the dimensions of the step back for your metal garage. The area in which we build a cut out for the garage door to fit in is shown about and below. 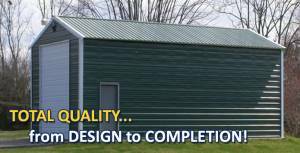 It is the width of the door and for our standard prefabricated metal building it is 5 inches wide and 3/4 inch deep. 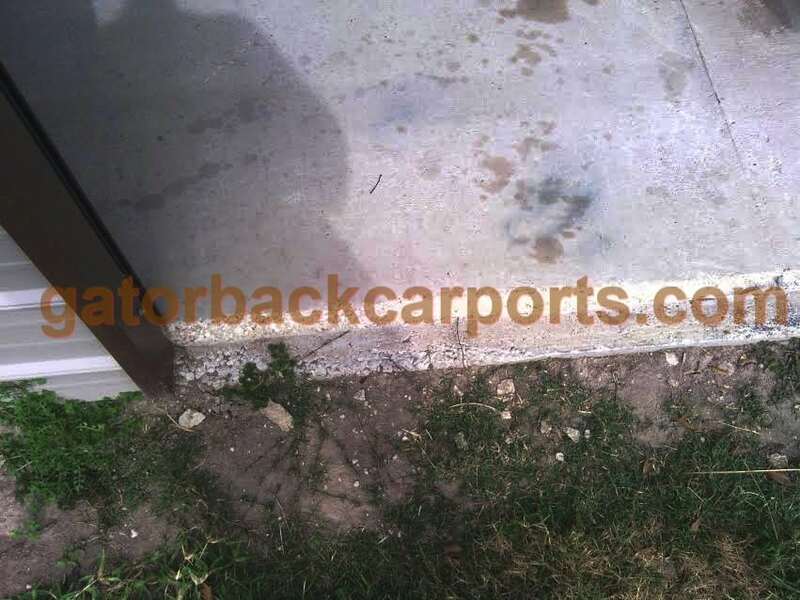 The five inches in width are because the vertical leg is 2 1/2 inches wide, the track for the garage door is 2″ wide and 1/2 ” set behind the track. 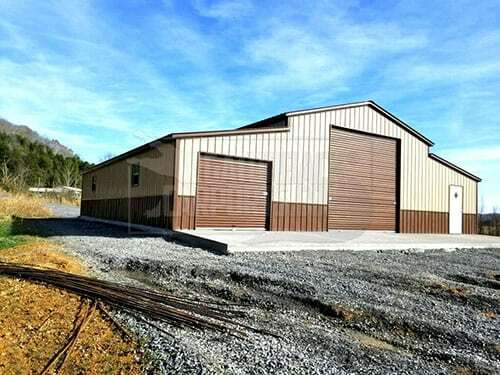 This angle of the garage door opening or frame out shows the leg and track on the left. 1. Install a string level (purchase at any hardware store) in the middle of a string you will run from the front to rear of the property your measuring. 2. Attach the string to two posts staked into the ground with the string at the same height on both post, adjust string until the level attached at the center of the string reads level. 3. Measure the distance from the ground to the string at each corner to determine any change in the level of the ground. 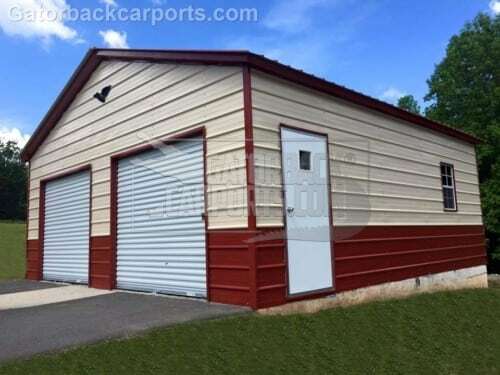 The colors of this garage are sandstone and earth brown. A good combination. There are two ditches in this picture. This garage was installed in Louisiana, and it is a good thing to consider all possible weather conditions. The overall ground around this carport is close to the same height, and with a severe rain, it could cause water to rise above the brick ledge of the foundation. Building your dirt pad above the average ground height can eliminate possible water entry. 1. 20′ wide by 26′ long by 7′ tall regular (horizontal roof) Garage includes two 8′ wide by 7′ tall commercial roll up doors in the front and rear, one walk in door, and one window for only $4,785. 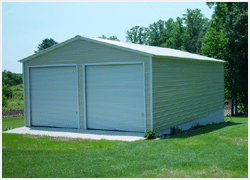 Garages range from 12 to 24 wide, (standard size widths) and up to 30 feet in length. The next size garages are our triple wide metal buildings which are available in sizes beginning at 26 feet to 30 feet in width and two hundred feet long or more. Our garages are available for viewing at the garage photo gallery. 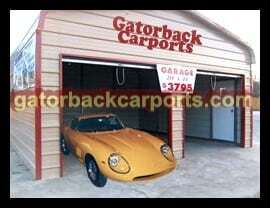 If you need any assistance please call the team at Gatorback Carports, we will be happy to assist you. Was this article informative, if so please share it with a friend.